#Formats & #genres are #rituals. Over the last week I’ve been tweeting notes and implications on reading What is Art For? by Ellen Dissanayake. It’s all about ‘making special’. A year ago I starting working on a performance piece libretto [I dare not call it opera as I detest that format…] dealing with our making of things, like baskets, knifes, houses and operas, and thus our specialness as a species, which may not lie in the making of things, so much as in the specialness we make. Here is a crude mind map of that twitter stream. The thought “Formats and genres are rituals” occured at the end of mapping out the tweets. 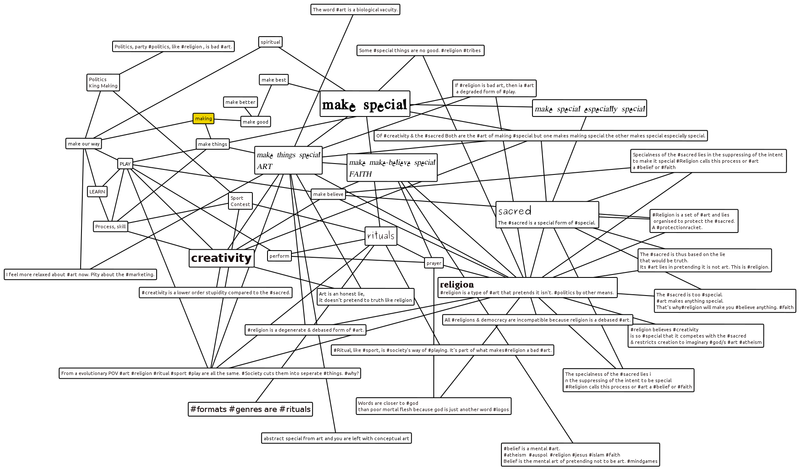 I am using a very simple mind mapper that doesn’t even use arrows, thus it is a very unstructured mind map. However as a first draft of an ontology of making, if not an ontogeny of special, I like it. In between the machine and the comparison lies a little bit of me, and you, that mirroring delusion; powerful, leveraged, reciprocal. For if the robot is our child, the infantry of our immortality, then our zombie ancestors whispered algorithms in chinese rooms until we came to hear our names in the signals for the first time, patterns in the noise indicating some love, some trespass, some forward looking hope. Otherwise the mystery still stings, a cypher in the snarling hole. The nineteenth-century art critic Théophile Thoré objected to the French term for still life, nature morte, proclaiming, “Everything is alive and moves, everything breathes in and exhales, everything is in a constant state of metamorphosis… There is no dead nature!” The Czech photographer Josef Sudek tersely echoed this thought when he said that to the photographer’s eye, “a seemingly dead object comes to life through light or by its surroundings.” via Threepenny: Smith, Still-Life Photographs. But now I view it as a staring outwards from the self but without reflection, without a mirror, and without introspection. More as a wide-spectrum apperception. A notice or consciousness without the buzz of self(-reference); a non recursive moment of attention when words fail our intentions, a nod to the end of a story and the return to camp with a basket of fruit, or a brace of game. The little essay quoted above, the spur for this post, explores another area why. No they are not dead, but very, very still, smelling a little funny perhaps. Another area it’s importance lies is in documentation. (The documentary moment, the turn to list and archive.) Trashlog has been going for many years now and it’s always has been one of my favourites, and is a project close to one I’ve had for nearly twenty years, and which, I hope is now finished. It will draw together these three areas that the frame of the still moment explores that the intention of self can use to document a case (Fall oder Einfall). You are currently browsing entries tagged with consciousness at FORMeika.